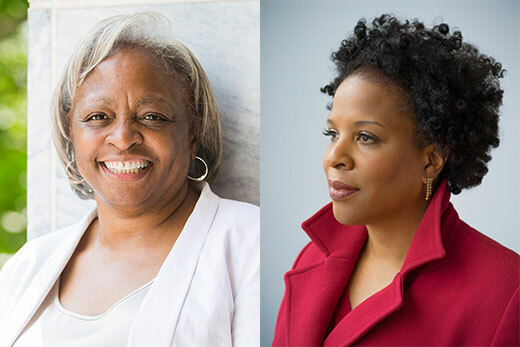 Out of hundreds of nominations for the prestigious National Book Awards, “One Person, No Vote” by Carol Anderson (left) was chosen among the top 10 for nonfiction and “An American Marriage” by Tayari Jones (right) made the top 10 for fiction. Out of hundreds of submissions, two Emory professors have earned a spot on this year’s longlists for the 2018 National Book Awards, according to an announcement this week by the National Book Foundation. Carol Anderson, a historian and Charles Howard Candler Professor and chair of African American Studies, and Tayari Jones, a professor of English and creative writing, both authored volumes that have been selected among the best in their respective categories for the National Book Award, considered one of the nation's most prestigious literary prizes. Both are faculty members in Emory College of Arts and Sciences. The National Book Awards seek to identify and reward quality writing; many previous winners are now firmly established in the canon of American literature, including such literary luminaries as Ralph Ellison, Flannery O’Connor, Louise Erdrich, Adrienne Rich and Jonathan Franzen. The longlist for each category includes 10 books. The lists of five finalists for each of this year’s awards will be announced Oct. 10; winners will be revealed on Nov. 14 at the 2018 National Book Awards Ceremony and Benefit dinner. To read more about the awards or to view the full lists, visit here. Out of 546 nominations submitted by publishers for the 2018 National Book Award for Nonfiction, Anderson was chosen for the top 10 longlist for her new book, “One Person, No Vote: How Voter Suppression Is Destroying Our Democracy” (Bloomsbury Publishing), released Sept. 11. In it, Anderson outlines a history of voter suppression in the United States, including recent changes within the electoral system, and the ways such tactics can impact citizens’ ability to vote. Through her research, Anderson also highlights the ways in which gerrymandering, poll closure and similar practices have effectively rolled back the participation of African American voters. An acclaimed public scholar whose research has long focused on the making and unraveling of public policy and how racism impacts that process, Anderson was also awarded a 2018 Guggenheim Fellowship. Her book, “White Rage: The Unspoken Truth of Our Racial Divide,” was a New York Times best-seller and won the 2016 National Book Critics Award in the Criticism category for her examination of policy responses to African American political and economic advancement. “White Rage” was also recognized as one of the best books of 2016 by the New York Times, the Washington Post, Boston Globe, St. Louis Post-Dispatch and the Globe and Mail. Jones, a New York Times bestselling author and award-winning writer, was named to the longlist for the 2018 National Book Award for Fiction for her novel “An American Marriage,” selected from 368 books submitted by publishers for the honor. Published this year by Algonquin Books, the novel tells the story of a newlywed couple whose pursuit of the American Dream is violently interrupted when one of them is incarcerated for a crime he did not commit. A New York Times bestseller and 2018 pick for Oprah’s Book Club, “An American Marriage” offers an intimate portrait of a relationship, exploring how class divides affect the black experience, the roles women are asked to play and a criminal justice system that looms over many communities. A native of Atlanta whose hometown frequently features in her writing, Jones is also the author of three other novels including “Leaving Atlanta”; “The Untelling,” which received the Lillian Smith Book Award; and “Silver Sparrow,” selected by the National Endowment for the Arts’ Big Read Library of Contemporary Classics. She joined the Emory faculty this year. She is a recipient of the Hurston/Wright Legacy Award and the Lifetime Achievement Award in Fine Arts from the Congressional Black Caucus Foundation, as well as a United States Artist Fellowship, NEA Fellowship and Radcliffe Institute Bunting Fellowship.